With rising housing prices and the lure of low interest rates, more Canadians are living house poor. We profile one family willing to talk about living "hand to mouth" as they struggle to keep their home and pay the bills. They look like the family that has it all. 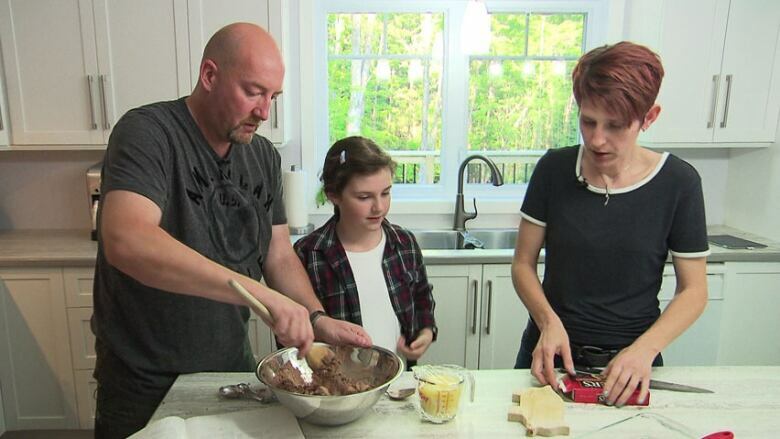 Louise Edgerton, her partner, John Camus, and her 10-year-old daughter, Fianna, joke around while making brownies. They move around with ease in the gleaming white kitchen of the new dream home they designed themselves. But for Edgerton, one financial setback could change everything. "I am discouraged, because I don't see the light at the end of the tunnel. It's a little bit of a house of cards that could fall down at any time," she says. The family is house poor, or as Edgerton puts it, "house rich and cash poor." 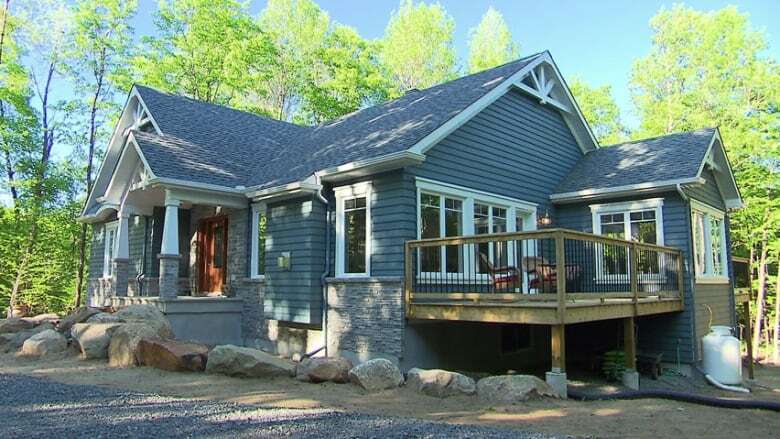 They live in Lachute, Que., about an hour outside of Montreal, far from the housing hot zones of Toronto and Vancouver. Edgerton estimates she and Camus spend 43 per cent of their combined income paying down their $418,000 mortgage and covering other fixed housing expenses. Once they pay the rest of the bills and buy groceries, "there is nothing left," she explains. She describes their existence as living "hand to mouth." Edgerton says she knows they're not alone. "I don't feel we are the only couple who are in debt and wondering how the hell we will get out of this." "It's the dirty little secret," she concludes. "Nobody talks about it." With skyrocketing house prices in some regions and the lure of ultra-low interest rates, more Canadians are living closer to the edge. But, naturally, many don't want to talk about their own house of cards. "There definitely is a lot more going on than we see," says Laurie Campbell, CEO of Credit Canada Debt Solutions. "Add the cost of running a vehicle to the cost of having a mortgage, the cost of raising a family [and] a lot of people are struggling. It could be your next door neighbour, it could be somebody at work, it could be one of your family members and you know nothing about it." According to Statistics Canada, Canadians' debt-to-income ratio in the fourth quarter of 2014 was at an all-time high of 163 per cent. That means for every dollar of disposable income in a typical year, Canadians carry $1.63 of debt. Campbell says that many, like Edgerton and Camus, are surviving now, but the big question is what happens if there's an unplanned setback — from a job loss to a rise in interest rates. "It worries me immensely that so many of us have allowed ourselves to live on the edge like this and not realize what happens should something out of daily life take a different turn," she says. Unexpected turns are exactly what drove Edgerton and Camus this close to the edge. Last year, just a week after they signed the deal to start building their house, Camus lost his sales job at a construction company. Then, the day before they moved in, their contractor handed them a surprise $27,000 bill for extra costs. The couple were forced to tap into their line of credit to pay for it. So far, they've managed. Edgerton still runs her own website design company. Camus recently found a new, largely commission-based sales job at a car dealership. "I feel we can handle what we are dealing with right now," he says. The two also say they live frugally, cutting out the extras and halting contributions to their retirement fund and an RESP for Fianna. But Edgerton's main concern is what happens if there's another financial emergency. "Should any bad luck happen, we are going to be in trouble," she believes. If enough people living house poor reach their own tipping point, it could affect the value of the housing market, says Campbell. "If the housing market goes down and those individuals have to sell, we're going to see a lot of houses on the market, which will further reduce the house market in general," says the debt counsellor. Some housing experts say there's no need to panic. Yesterday, the Canada Mortgage and Housing Corporation reported that the country's housing markets, overall, will remain stable, though they may slow down over the next two years. Camus is also sanguine about his own situation. He believes he and Edgerton won't get to the point where they have to sell their home. With his new job, he expects his financial situation will improve. "I don't share the same stress levels [as Louise], because I do think our situation will get better." He adds, "Owning a home is a question of pride for me." Canada has among the highest home ownership rates in the world; owning a home is one of the ultimate Canadian dreams. And it's perhaps why so many people choose to live house poor rather than sell their home. And it's probably why some people, no matter what their circumstances, won't give up their home without a fight. "I want to say, no matter what happens, we'll just deal. That's what we've always done. But, you know, how long can we keep that up?" asks Edgerton.